We’ll be explaining how to change weather and even change entire seasons in your game. 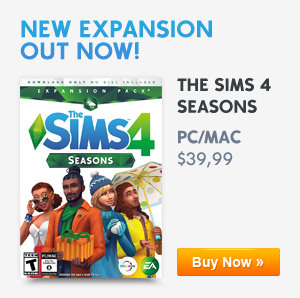 You’ll need The Sims 4 Seasons to get different weather conditions. There isn’t a cheat to do this so we have to work with the materials The Sims gave us. You can use the Weather Control Device for all your weather conditions but you can also go into your game options to turn a few options off. Do you want to control the Weather and change seasons? Place the Dr. June’s Weather Control Device and level up your Handiness skill! You can find the Weather Control Device in the Outdoor Activities section under Activities and Skills. A Sim with a low Handiness skill level can fail changing the weather. Take that into consideration before using this machine. If it fails your Sim they may get electrocuted and becomes dazed for a period of time. If you get electrocuted for the second time while still dazed, your Sims will die. If succeeded, this will only change the current weather in your neighborhood. It won’t change the forecast. Options: Blizzard, Clear Skies, Cloudy Skies, Cold, Heatwave, Hot, Rain, Snow and Thunderstorm. This lets you change the forecast of the weather this season. This options will change the entire season to Spring, Summer, Fall and Winter. You need to upgrade your Weather Control Device if you want to be able to change the season. You’ll need to level your Handiness skill to level 8 before this option unlocks. You can do this by repairing objects or read a book about Handiness. You can order books from the computer. Success chance is increased when dealing with snow and rain. The machine will now break less frequently. Success chance with snow and cold interactions has been increased! The success chance for clear skies interactions is increased! The machine can now be used to manipulate the climate of the current season. Now the machine will never break! 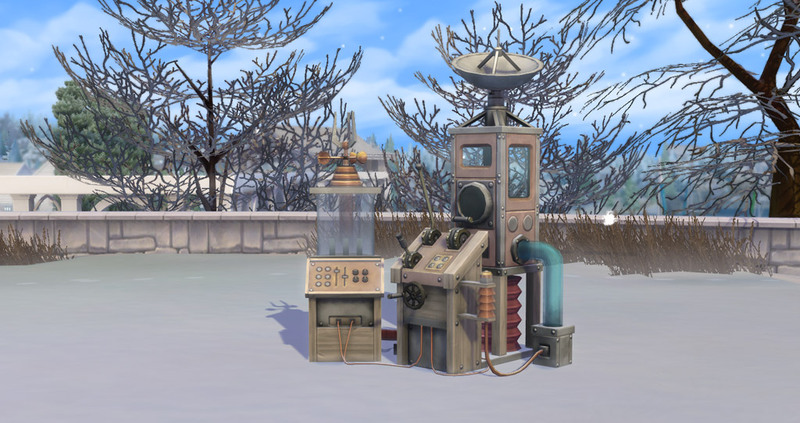 The machine can now be used to change seasons! Hit Esc and go to Game Options. In your menu on the left you’ll see the option ‘Seasons’. 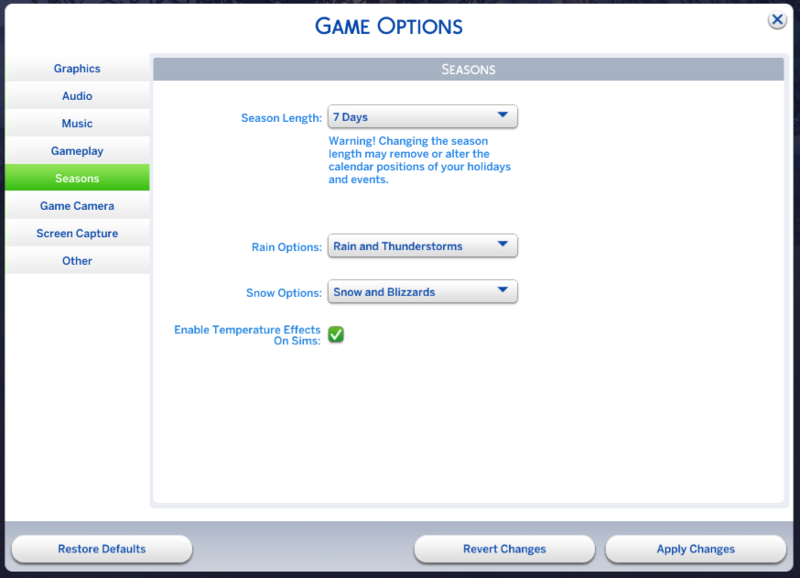 You can change the season length, rain options, snow options and if Sim will be affected by temperature. The options for the length of each season are: 7 days, 14 days and 28 days. You can’t choose the length for each season individually. Changing the length of seasons will have effect on your current events and holidays. Events that are now more than 2 weeks in advance will be removed from the calendar so take this into account before you change anything. If you don’t want rain, thunderstorms, blizzards or snow you’ll have the power to turn them off. This can also help if the game is a bit laggy on your computer when those weather effects occur. 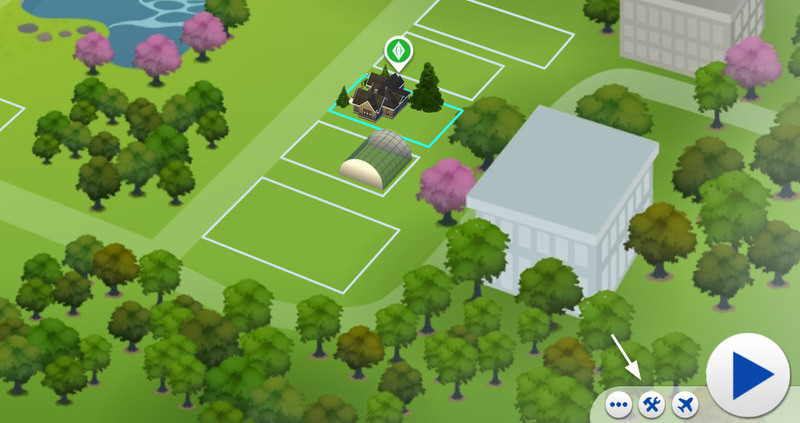 If you’re playing with a Sim and you want to build a new house for them, don’t select the big play button on the right, instead use the Build button. This will bring you to the lot with neutral sunny weather.